St William was born in Perth, Scotland. He attended daily Mass, was well known locally and, as a baker, gave every tenth loaf of bread that he baked to the poor. Once, when St William arrived at Church for morning Mass, he encountered an abandoned child. St William accepted the child as his son. He named him David, cared, fed, clothed and educated him in his own trade. When St William planned a pilgrimage to Rochester, Canterbury and possibly onwards to Jerusalem, he took David, now a young man, with him. Outside Rochester, David tricked St William into going by a different route, supposedly it was much shorter; David’s intentions were to betray his father and steal his money. In the process of the robbery, events turned very violent and David killed St William, hitting him on the head and cutting his throat. When a local mentally ill woman came across St William’s body, she was miraculously cured. News of the murder and the woman’s healing quickly spread. St Williams body was taken to Rochester and buried in the Cathedral whereupon multiple other miracles were reported. 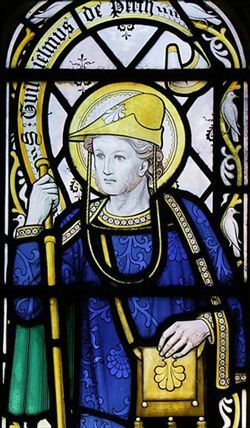 St William is the Patron Saint of adopted children. His Feast Day is May 23rd. Pray for us that we will respect and listen to our parents and family.